From the New Zealand Garden Journal (Journal of the Royal New Zealand Institute of Horticulture), Volume 5, Number 2, December 2002, pp. 12-14. There are 30-40 species of Gunnera (family Gunneraceae) distributed naturally almost exclusively throughout the southern hemisphere. 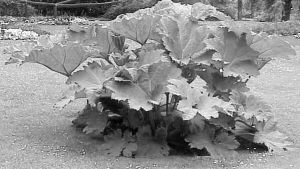 The largest and most famous are Gunnera manicata (giant ornamental rhubarb, native to mountain swamps of Brazil) and G. tinctoria (Chilean rhubarb) (Figure 1). They have large (1.0-2.4m diameter) leaves with prickly petioles attached to a stout rhizome. A vertical section through the stem of G. tinctoria (Figure 2A) reveals dark green nodules. 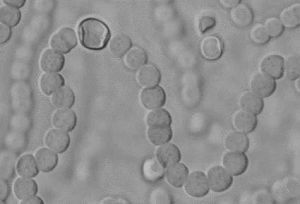 If you examine one of these nodules under a microscope you will find beads or filaments of the blue green alga (cyanobacterium) Nostoc. What is the significance of this visitor to the life of Gunnera? Figure 1. The magnificent and infamous Chilean rhubarb (Gunnera tinctoria). Chilean rhubarb is a fully naturalised exotic plant in New Zealand, but it has weedy potential and features in the National Pest Plant Accord List. A mutually beneficial symbiotic relationship exists between the alga and its host. Gunnera provides Nostoc with carbohydrate and an intracellular living space. And, for providing shelter and three square meals a day, the Gunnera gets nitrogen in exchange.There are vast amounts of nitrogen gas (as the diatomic and highly stable molecule N2) in the air that we breathe. In fact, 78% of the atmosphere consists of N2. Plants cannot utilise nitrogen directly as N2. Rather, they assimilate nitrogen as ammonium (NH4+) or nitrate (NO3-), generally from the soil via the roots. But imagine if plants were able to tap more directly into that atmospheric source of nitrogen. That's exactly what Nostoc does for the Gunnera. (Top) A vertical section through a stem of G. tinctoria, showing a dark green nodule, the site of the Gunnera-Nostoc symbiosis. 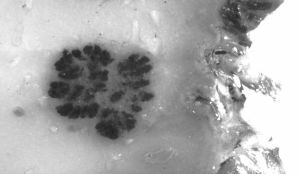 (Bottom) A filament of a free-living form of Nostoc with predominantly vegetative cells and a few nitrogenase-containing heterocysts. There are two types of cell on a Nostoc filament: vegetative cells and heterocysts. The heterocysts contain the enzyme nitrogenase, which converts N2 gas into NH4+, a process known as nitrogen fixation. The ammonium is then assimilated by Gunnera. There is a huge increase in the frequency of heterocysts in symbiotic Nostoc (up to 80% of cells) compared to free-living Nostoc forms (5% of cells) (Figure 2B). How does this occur and what is its significance? As stated earlier, Gunnera provides carbohydrate to Nostoc. Therefore less cellular machinery is required for photosynthesis, which is located in the green vegetative cells. The provision of carbohydrate by the host allows the cyanobacterium to become in a sense a nitrogen-fixing factory. This enables Gunnera to colonise habitats with low soil nitrogen. For example, the native Gunnera species are commonly used as ground cover in rock gardens. The nitrogen-fixing symbiosis between white clover (Trifolium repens) and the bacterium Rhizobium has a high profile in New Zealand because of its commercial significance to the pastoral industry. While the Gunnera-Nostoc symbiosis does not have the same profile, it is the subject of some attention as researchers continue to unlock the mysteries of how symbioses involving nitrogen fixers operate. Figure 3. A strawberry-like runner of the New Zealand Gunnera monoica: Ideal propagating material and research subject. I propagated Gunnera monoica (Figure 3) for my research by cutting sections of a runner (one or more nodes with leaves and roots attached), placing them in a tray of coarse sand, and feeding them weekly with a liquid fertilizer that contained no nitrogen. I grew mine in a greenhouse to get good growth over the winter months and then in a shadehouse in summer. I grew my cuttings in sand so that the plants could be removed intact for analysis, and the nutrient regime could be controlled for optimum nodule production and nitrogenase activity. The plants were easy to grow. My gunnera had the same green nitrogenfixing nodules in the stem of the leaf as G. tinctoria. Nodules in G. tinctoria are a lot larger than those in G. monoica, but relative to the size of the plant they would be comparable. Figure 4. A flowering specimen of Gunnera prorepens (Courtesy Mark Dean of Naturally Native New Zealand Plants Ltd., Tauranga). Gunnera monoica provides a beautiful model system to study nitrogen fixation. I would not describe the plant itself as beautiful (especially when my research was not going well), although I would not call it ugly either. This species has a different habit from its larger cousins, looking more like a strawberry plant, with relatively small leaves and stoloniferous growth. It does not have the spiny leaf margins of G. tinctoria, so it is less problematic to stroke! To be fair, I only ever saw my plants growing in trays, and it could look good draped over a rock in the garden, with a pond nearby. Some of the other Gunnera species appear to be pleasing to the eye because of the colour of their fruit, e.g. G. prorepens (Figure 4) (cf. G. monoica, in which the fruit are white), and how they are used in a garden. The Landcare Research New Zealand Plant Names Database [http://nzflora.landcareresearch.co.nz/default.aspx] lists five endemic Gunnera species, including the diminutive G. monoica (Figure 3). 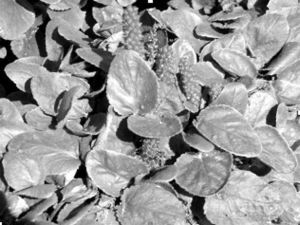 Other sources of information on Gunnera are [http://www.naturallynative.co.nz/index.html] and [http://www.kadel.cz/flora/t/kvResult.asp-Rod=Gunnera.htm]. None of the New Zealand endemic Gunnera can match the magnificent stature of Chilean rhubarb (G. tinctoria), which is a fully naturalised exotic plant in New Zealand. Although this species grows wild in only a few localities, it is judged to have weedy potential, especially on coastal cliffs, wetlands, slips and roadsides. It appears on the National Pest Plant Accord List as a plant that is prohibited from sale, propagation and distribution in New Zealand. Mike Harré, Biosecurity Officer (Response) with Auckland Regional Council, reports that G. tinctoria is a problem in Taranaki, and that this species (or possibly G. manicata) is also establishing on Banks Peninsula. An excellent article, which describes and illustrates the differences between G. tinctoria and G. manicata, was written for our journal by Bill Sykes (Sykes, 1969). Figure 5. 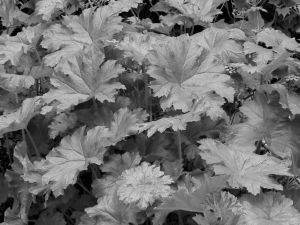 This is Darmera peltata, a member of the saxifrage family that could be a streamside replacement for Chilean rhubarb (Gunnera tinctoria) in cool areas. See D. peltata growing in Wanaka in this issue of The Garden Journal (p. 17). This species is described in the literature as a native of Oregon, having clusters of small pink flowers borne on erect stems before the leaves appear. It is also known as Indian rhubarb, umbrella plant or Peltiphyllum peltatum, and is reputed to have edible stems [www.backcountryrangers.com/edibles/Saxifragaceae.html]. Photo courtesy of Stonecrop Gardens, Cold Spring, New York, USA. Auckland Regional Council recently published and released the Plant Me Instead booklet. This encourages gardeners in the Northern Climatic Zone (broadly Northland, Auckland, northern Waikato, coastal Bay of Plenty and East Cape) to look for alternatives to their favourite, but environmentally pesky plants. For Chilean rhubarb, recommended alternatives are plantain lily (Hosta), golden rays (Farfugium japonicum, formerly Ligularia tussilaginea) and ornamental rhubarb (Rheum) cultivars. 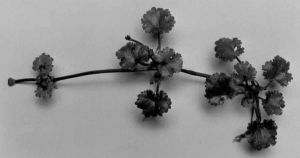 See also Darmera peltata (Figure 5). Sykes, W.R. (1969). Gunnera tinctoria and Gunnera manicata. Journal of the Royal NZ Institute of Horticulture 1:56-59. Paul Stock became interested in nitrogen fixation during his MSc research at Waikato University. He now works as a Tutor in Cell and Plant Biology at Massey University.